The kiwi (Actinia deliciosa) is part of the Actinidiaceae family, and it originated from Asia. 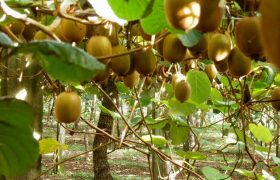 The kiwi rapidly spread throughout the globe starting with the 19th century, presently it is cultivated in France, Greece, Chile, Spain, Australia, Italy, USA, etc. This is cultivated for its fruits, but also for decoration purposes. The kiwi fruit has vitamin A, C, E, calcium, folic acid, phosphorus, potassium and carbohydrates. This plant grows as a vine, it can be 5 to 7 meters long. Its leaves are big, dark colored and shiny. The young leaves are covered the red colored hairs, the mature leaves are covered by dark green colored hairs. This is a unisexual dioecious species. Its flowers are big (2-5-cm), white, and grow at the leaves’ axilla. The fruit is oval, 6-7-cm long, covered by a brown, pubescent peel. The flowers bloom during May and June. 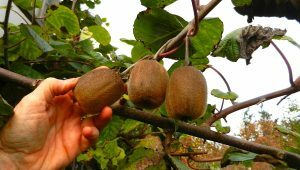 The kiwi plants are not self-fertilizing plants, but the modern genetic engineering has created self-fertilizing soils (examples: Jenny). The fruit’s pulp if firm, it can have different colors, from green to yellow. The temperature is a constrictive factor for the kiwi growth during many regions. The kiwi species is sensitive to frostbite. This is why it needs to be planted in areas where there is no frostbite risk. 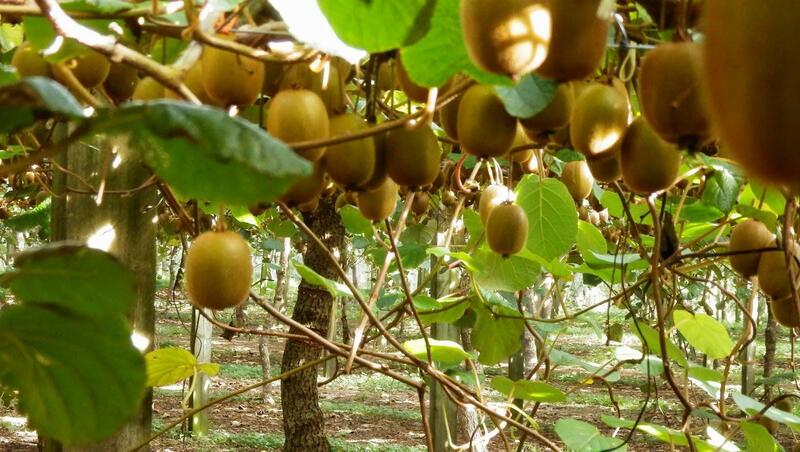 The kiwi plant has a long vegetation period and it prefers long autumns and warm springs. The plant has medium to high preferences when it comes to light. It can be planted on sunny parcels or on soils which have a southern exposure. It is sensitive when it comes to humidity. It doesn’t like drought, or excess humidity. We recommend using a micro-sprinkler irrigation system to efficiently balance the humidity within the soil. This plant can grow and develop properly on soils which have a high humus percentage, with a high air-water content and a pH ranging from 6.5 to 7.5. it doesn’t like soils which are reach in carbonates. The soil must be chosen taking into consideration the species’ climate and soil requirements. This shrub grows well on well illuminated soils and it also allow you to install a support system for their growth. This species prefers a fertile soil, with a high air-water regime. Is doesn’t like saturated soils. The kiwi plant is sensitive to wind. This is why you must carefully choose the parcel where the kiwi crop is about to be started. The soil must be prepared starting from summer. The parcels must have all the vegetal residues from the previous crop removed and the soil needs to be ploughed at a 30-cm depth. If needed, the soil can be levelled. A few days before planting, the soil can be ploughed once more. The correct planting period is either during autumn or during an early spring, when the plants have their vegetative rest period. The soil must not be frozen, the temperatures must not exceed 5 degrees Celsius. The recommended planting scheme can be followed: a 4-m distance between the rows and 3-m distance between the plants on each row. After agreeing on the correct planting scheme, the parcels can be marked. This consists of placing a stake inside the soil where each plant needs to be sowed. We must not forget that the kiwi is a unisexual, dioecious species and in order to have an efficient pollination, the male – female flowers ratio must be 1:1. The holes can either be dug manually or mechanically. The dimensions of the holes must be 40 x 40 x 40 cm. During the first vegetation years, the kiwi crop is sensitive to weed growth. This is why the space between the rows must be kept clean. This can be done by regularly ploughing or by applying herbicides. The herbicides will have to be locally applied, not to affect the young kiwi plants. After 3 years from planting, the spaces between the rows can be cleaned using perennial herbs. These will have to be periodically mowed, once they reach a height of 10-15-cm. This is an essential process for the kiwi crop, starting with the third vegetation year. during the first vegetation years, the vines grow normally, but starting with the third year, the plants need extra fertilizing. A layer of well decomposed organic compost can be applied locally, around the plants. Chemical fertilizers are not recommended for the kiwi plants. This is a mandatory step in the kiwi’s crop technology, due to the plant’s sensitivity towards water. Frequent watering is recommended as this keeps a constant humidity level, and the plants love it since they cannot survive drought, nor can they survive the excess humidity. the irrigation system to be used is the micro-sprinkler irrigation. By using this, it will also help control the atmospheric humidity, as the kiwi plant prefers a high atmospheric humidity. 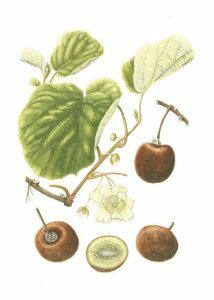 Due to the botanic particularities of this species, the kiwi crop needs extra support. We recommend a T shaped pillar system, with 2-3 wires. The height of the system must be 2-2.5 meter long, the pillars must be pushed into the soil at a 60-cm depth, so that the plants could be located at a 2 meters distance from the soil. The kiwi plant is normally resilient to pests and diseases. Generally, it does not need phyto-sanitary treatments and it can normally grow without being affected by biotic factors. The cuts represent an important operation in the kiwi’s crop technology. This can be done either during early spring days, or during the vegetation period. 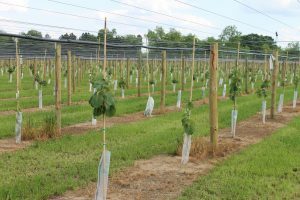 Right after planting, the vines need to be shortened at a 30-40-cm height as this will assure a vigorous growth. The plant’s main axle will have to be conducted vertically on the supporting system. The side ramifications will be conducted at a 90 degrees angle. Once the central axle has reached a meter in height, its tip will have to be suppressed to favor the plant’s development sideways. 5-6 vigorous and well developed side branches need to be kept. During the vegetation period, the side ramifications will have to by shortened to 4-5 sprouts, to favor the growth of the foliage. The greedy sprouts, the intersecting branches, or the ones growing towards the interior of the plant will have to be cut. Starting with the third year, the crop will start to bear fruit. During this period, the cuts will be intended to replace dry fruit bearing branches with younger ones. The chosen sprouts will have to be attached to the supporting system. 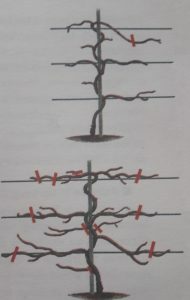 During the vegetation period, the fruit bearing branches will have to be cut to 3-5 leaves after the fruit formations as this will create new ramifications. After these new ramifications will have grown, these will have to be shortened to 1-2 sprouts. This will help the plant grow its foliage. One the plants start getting older, rejuvenating cuts will have to be applied. The old fruit bearing formations will have to be cut to 2-3 sprouts. This rejuvenating process will have to be done for 3-4 years. This step needs to be done once the fruits have reached their maturity. Looking at the calendar, this can be done during mid-October. The kiwi fruit has a great storing capacity, being able to be stored between 3 to 6 months. The optimum consumption period is when the pulp of the fruit is soft. These fruits can post-mature quicker if we place them inside a plastic bag, along with apples or bananas.